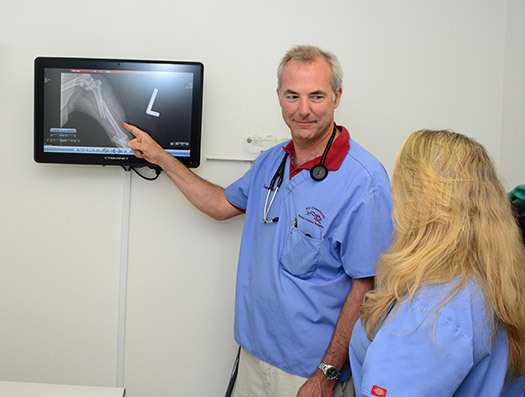 Digital X-rays provide Dr. McSweeny with fast results, as the digital format provides a more enhanced image and eliminates processing and development time required with traditional x-rays. X-rays are very useful for diagnosing medical problems. If we feel a lump or mass in your pet's abdomen, an X-ray can determine where the mass is located and can very often pinpoint the organ where the problem is occurring. A mass or foreign object in the stomach is often easily seen in an X-ray. If your pet is vomiting, an X-ray can reveal whether your pet has eaten string, stocks or a large part of his/her toy. Digital X-rays help us evaluate skeletal, cardiopulmonary or chest x-ray, abdominal, reproductive, and urinary systems. It is the perfect tool for OFA x-rays of the hips and elbows. Dr. McSweeny uses only cesium digital x-ray plates. This ensures that your pet gets the best detailed "HD" x-rays and the lowest exposure. Endoscopy allows Dr. McSweeny to visually exam your pet's internal organs and body parts without invasive exploratory surgery, allowing for more accurate diagnosis and treatment of diseases. It is a flexible tube that is inserted through the natural openings of your pet’s body. It allows Dr. McSweeny to view your pet’s gastrointestinal system in full color. Areas of inflammation or ulceration are easily seen. Masses, strictures and foreign bodies (hair balls, bones, toys, rocks, socks, coins, etc.) may also be seen. Endoscopic procedures offer their patients less pain, minimal recovery time and fewer complications.